Spears of fresh pineapple, coated in brown sugar and cayenne, then grilled to perfection. Only three ingredients but packed with flavor. 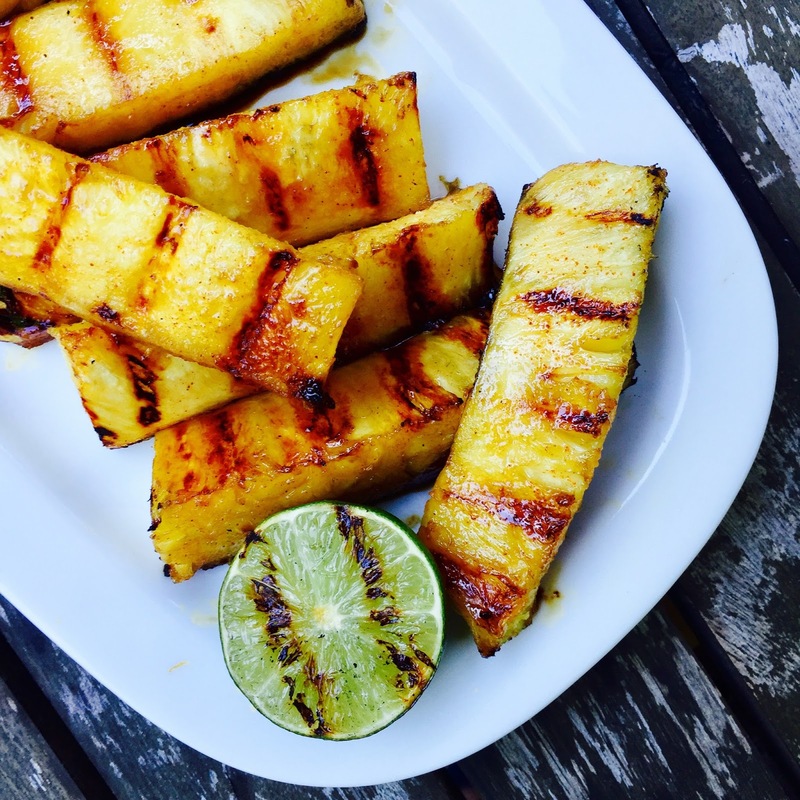 Spicy & Sweet Grilled Pineapple Spears is a favorite recipe for summer BBQs and #CookoutWeek! Get those grills fired up... because it's #CookoutWeek 2017! This week, the Full Belly Sisters are joining forces with over 40 food blogger friends to bring you delicious recipes that are perfect for every backyard BBQ, picnic, summer party, or cookout. We also have a fabulous giveaway featuring products from the brands that have made Cookout Week possible. Enter below to win! I've got a vegetarian dish for your summer cookouts. I'm not a vegetarian but I'm always super bummed when I go to a BBQ and there's only meat. I at least need some lettuce and tomatoes on my burgers! So, when I host, there's lots of fruit salads and grilled veggies. 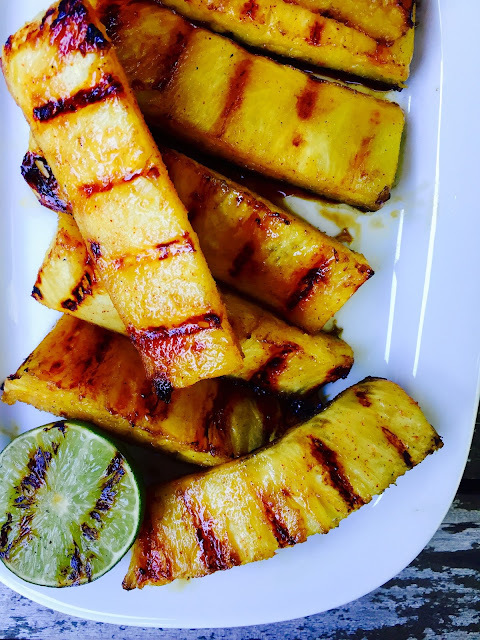 And even grilled fruit, like these super easy Spicy & Sweet Grilled Pineapple Spears. Sweet and just a bit spicy, they're a fantastic complement to the rest of your barbecue fare. Preheat your grill to medium heat, 350-400 degrees. In a pie plate or other rimmed dish, mix together brown sugar and cayenne pepper. Roll the pineapple spears in the mixture until they are mostly coated. Place the pineapple spears on the preheated grill and cook until grill marks appear and the pineapple is cooked the way you like it. 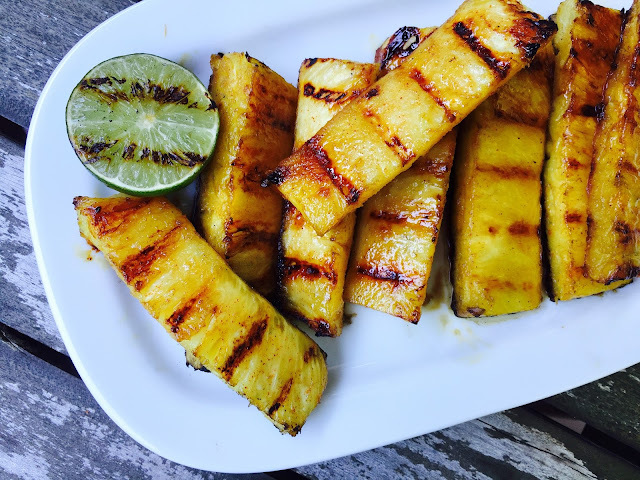 I also like to add a 1/2 lime—coated with some oil—to the grill; the heat really loosens up the juices and it's wonderful, squeezed over the pineapple. Serve as is with whatever meat you've got on the menu. Or make these for dessert and pair with some good vanilla ice cream! As one of the bonus entries in the giveaway, leave a comment on this blog post...have you ever tried grilled fruit? What's your favorite? It's SOOO good, i agree! We love grilling pineapple around here. The hint of cayenne has to make this amazing. Yum, I love grilled pineapple. Mmmm! I've made grilled pineapple and grilled peaches, and both are delicious! I wonder if skewered berries would be good? This looks great!